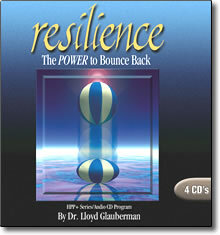 Resilience HPP CDs by Dr. Lloyd Glauberman – Discount! How do you get your body, mind and spirit to bounce back? How do you set the right pace so that you don’t get burned out in the first place? Now, you can live a healthy life … by tapping the power of your unconscious mind. Resillience is a cutting-edge audio program that uses the hypnotic storytelling technique, Hypno-Peripheral Processing, combined with Hypno-Meditation to unlock the power of your unconscious mind. Clinically developed, Resilience places you into a deeply relaxed state, ideal for the absorption of positive suggestions. You will find yourself relaxed, energized, and centered–ready to tackle all of life’s challenges. Dr. Lloyd’s Glauberman’s revolutionary HPP technology programs your unconscious mind to develop the necessary skills to cope with life’s ups and downs. Resilience helps you organize your thoughts, feelings and actions. This program also contains Hypno-Meditation, a second hypnotic technology that bolsters and supports you conscious mind’s decision making capabilities and coping skills. Give yourself the tools and techniques to make it to the finish line every day with Resilience.